Above: A publicity portrait of Buster Crabbe from his days at Paramount Pictures. Crabbe was born Clarence Linden Crabbe in California. His parents moved to Hawaii when he was two years old; growing up so near the ocean, he became an expert swimmer. After he finished college, his plans to become a lawyer were sidetracked by his promising athletic career. He took his swimming skills all the way to the Olympics, winning a bronze swimming medal in 1928 and a gold medal in 1932. His swimming success brought him to Hollywood’s notice, and Paramount Pictures signed him to a contract in 1933. The studio changed his name to “Larry Crabbe,” but he retained his childhood nickname of Buster throughout his career. Paramount started off their new star’s career with a bang, giving him the lead role in their 1933 feature, King of the Jungle. This big-budget jungle adventure was a Tarzan film in all but name, capitalizing on MGM’S Tarzan movies and starring Crabbe as “Kaspa,” the Lion Man. Unfortunately, Crabbe’s success as a Tarzan clone caused him to be typed as more athlete than actor, and Paramount had no objection to loaning such a “limited” contract player to independent producer Sol Lesser. The hustling Lesser, through an earlier deal with Edgar Rice Burroughs, had the right to make his own Tarzan serial, and Crabbe was a natural for the role after King of the Jungle’s success. Judging from the footage that survives (the serial exists today only in a cut-down version), Tarzan the Fearless (Principal, 1933), was a rather inauspicious serial debut for Buster. The chapterplay’s writers and directors appear to have forced poor Crabbe into a rather unappealing portrayal of Tarzan; Fearless’s version of the Ape Man was even less articulate than the “noble savage” of the MGM films, laughed like a deranged hyena when amused, scowled childishly when irritated–and also became more and more detached from the action as the serial progressed; while he repeatedly came to the rescue of love-interest Mary Brooks (Jacqueline Wells) in earlier episodes, he spent too much of the later episodes on the sidelines, either injured or unconscious. Crabbe himself referred to this version of the character as an “ignorant brute” and a “loincloth leviathan” in his autobiography, adding that “no amount of promotion” could save the serial. Above: Buster Crabbe and elephant are featured on a lobby card for Tarzan the Fearless (Principal, 1933). Paramount kept Crabbe on contract until 1939, but never gave him a leading role to match King of the Jungle, instead using him mostly in juvenile leads or heavy parts. In 1936, they loaned him out to do another serial; this one was for Universal, and was a big step up from Tarzan the Fearless. Its title was Flash Gordon. Based on Alex Raymond’s comic strip, Flash Gordon featured expensive production values far beyond those of the average serial, but its phenomenal success easily rewarded Universal’s expenditure. Crabbe starred as young athlete Flash Gordon, who joins forces with scientific genius Dr. Zarkov (Frank Shannon) to save the Earth from the schemes of the interplanentary tyrant Ming the Merciless (Charles Middleton). Flash, Zarkov, and heroine Dale Arden (Jean Rogers) spent the bulk of the serial’s thirteen chapters encountering one strange peril after another on Ming’s planet of Mongo, finally witnessing the death of the despot in the final chapter and returning to Earth. Flash Gordon, with its colorful characters, strong performances, and fantastic settings, was one of the most memorable serials of all time, and gave Crabbe the part that would define his career. He excelled as the tough, chipper, act-first-think-later Flash, making the character seem brave enough to rocket into space with Zarkov in a last-ditch attempt to save the world, noble enough to resist the blandishments of Ming’s daughter Aura (Priscilla Lawson), and foolhardy enough to attack the enthroned Ming in the midst of the villain’s guards. Above: Jean Rogers looks on as a grinning Buster Crabbe prepares to tackle Duke York Jr. (as Kala, King of the Shark Men) in Flash Gordon (Universal, 1936). Above: Buster Crabbe as Flash Gordon confronts an off-stage Ming, having triumphed in a Mongo “tournament of death.” Richard Alexander is behind Crabbe on the left in this scene from Flash Gordon. Flash Gordon made Crabbe a familiar face to matinee audiences, and Paramount took advantage of this by starring him in several “B plus” Western features like The Arizona Raiders and Forlorn River over the next couple of years. The studio loaned him to Universal again for his next serial, Flash Gordon’s Trip to Mars (Universal, 1938). In this sequel, Flash, Dale, Zarkov, and a reporter named Happy journeyed to Mars to thwart the attempts of Ming (whose demise in the previous serial was explained away) and the Martian Queen Azura (Beatrice Roberts) to drain off the “nitron” in the Earth’s atmosphere. After numerous clashes with Ming and Azura’s forces, Flash and his friends again saved their planet from danger, and brought about the downfall of Ming. Charles Middleton, Frank Shannon, and Jean Rogers all reprised their roles alongside Crabbe in Trip to Mars, which possessed a somewhat swifter pace than Flash Gordon, and was almost as full of memorable locations (the weird Forest Kingdom) and characters (the cave-dwelling Clay People) as the earlier serial. This time around, Flash was allowed to be considerably more intelligent and less reckless than in the first serial, but still came off as an affable “regular guy,” a perfect counterpoint to the serial’s out-of-this-world setting. Above: Buster Crabbe swings down to battle the Tree Men of Mars in Flash Gordon’s Trip to Mars (Universal, 1938). Above: Dr. Zarkov (Frank Shannon, far left) and Flash (Buster Crabbe) hold Ming (Charles Middleton) prisoner and plot an escape from Queen Azura’s palace in Flash Gordon’s Trip to Mars. Crabbe did two serials for Universal in 1938, the second being Red Barry. Based on a comic strip by Will Gould, the serial followed the adventures of police detective “Red” Barry as he took on gangsters, Russian exiles, and Chinese spies in a struggle over two million dollars’ worth of bonds. The serial, featuring no less than four villainous and semi-villainous factions in competition for the bonds, was hampered by a rather confusing plotline, but benefited from some excellent acting, particularly that of Wade Boteler as Inspector Scott, Phillip Ahn as Hong Kong Cholly, and Frances Robinson as reporter “Mississippi.” Crabbe also delivered an excellent performance, and was ideal in the role of the scrappy Barry, a two-fisted and unconventional cop who refused to abide by strict protocol and was always in hot water with the pompous police commissioner. The serial allowed Crabbe to deliver one of the finest pieces of acting in his serial career, in a scene where Barry was threatened with dismissal from the police force just after a friend of his was killed by the villains; Crabbe quietly but fervently vowed that, with or without his badge, he’d get the men responsible for the death. Above, from left to right: William Gould, Frances Robinson, Buster Crabbe, and Wade Boteler in Red Barry (Universal, 1938). In 1939, Crabbe’s Paramount contract expired and was not renewed; Paramount, a studio that made no serials and few B-westerns, apparently felt there was no point in retaining an actor who was now firmly typed as a Saturday-matinee lead. Also in 1939, Buster starred as another science-fiction hero in another Universal serial, playing the title role in Buck Rogers–derived, like Flash Gordon, from a popular comic strip. Crabbe, as Rogers, was a 20th-century adventurer who, together with his young friend Buddy Wade (Jackie Moran), awakened from a state of suspended animation to find the world was now ruled by the evil Killer Kane (Anthony Warde). Joining forces with a group of anti-Kane rebels (including Constance Moore as Wilma Deering and C. Montague Shaw as Dr. Huer), they set out to bring down the dictator. Buck Rogers was an imaginative, entertaining serial that suffered disadvantageous comparisons to the more colorful Flash Gordon cliffhangers, both on its original release and in later years. Like the Gordon outings, it benefited greatly from Crabbe’s ability to handle fantastic scenes and dialogue with matter-of-fact cheerfulness. Above: Buster Crabbe has the drop on Tom Steele in Buck Rogers (Universal, 1939). Jackie Moran is on the left. Above: Jackie Moran, Buster Crabbe, and Constance Moore in a publicity still for Buck Rogers. Universal had planned to star Crabbe in a sequel to Buck Rogers, but when that serial proved relatively unsuccessful, they chose instead to revive the tried-and-true Flash Gordon characters one more time in 1940’s Flash Gordon Conquers the Universe. Crabbe returned as Flash, and Frank Shannon and Charles Middleton also returned as Zarkov and Ming, but other recurring characters–including Dale Arden–were recast. Nevertheless, the serial was a worthy finale to an excellent trilogy of serials. Flash and his friends were pitted against Ming once more, as the villain unleashed an arsenal of futuristic weapons in an effort to subjugate Mongo and the Earth. Universe placed greater emphasis on action than the two earlier Gordon serials, but did not sacrifice the colorful characterizations that had made those serials so good. Crabbe gave another likable, assured performance as Flash, ending his career at Universal on a high note. Above: Buster Crabbe (center) listens to a radio message from Ming in Flash Gordon Conquers the Universe (Universal, 1940). An unidentified player is seated at the radio; the other actors, from left to right, are Lee Powell (back to camera), Frank Shannon, Edgar Edwards (behind Crabbe) and Roland Drew. Above: Flash (Buster Crabbe) laughs at the evil Sonja’s (Anne Gwynne) attempts to charm him in Flash Gordon Conquers the Universe. After the final Flash Gordon outing, Crabbe found work with shoestring producer brothers Sig and Sam Neufeld, who released their films through PRC (Producer’s Releasing Corporation). Perhaps influenced by some memory of Crabbe’s Western films for Paramount, the Neufelds put Buster into the saddle for a very long-running series of B-westerns. Though the films’ production values were scanty compared to the B-westerns of Republic or Universal, the PRC series was often very enjoyable, principally because of the wonderful rapport between Crabbe and his comic sidekick, Al “Fuzzy” St. John. When his PRC series ended in 1946, Crabbe returned to serial work–but not at Universal, since the studio closed their cliffhanger unit that same year. Instead, he wound up at Columbia Pictures, playing radio/comic book hero Captain Silver in The Sea Hound (1947). Silver was a ship’s captain who got mixed up in a search for Spanish gold in the Pacific Islands, battling a piratical master criminal called the Admiral (Robert Barron) along the way. 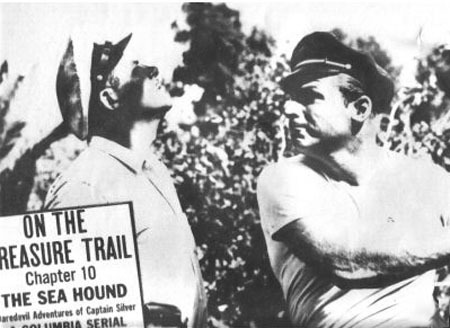 Sea Hound was not in the same class as the Flash Gordon serials, since there was a world of difference between Universal’s serial budgets and those of Columbia producer Sam Katzman, but with extensive location shooting (on Catalina Island), an interesting villain, and some quirky supporting heroes, it emerged as one of Katzman’s more watchable cliffhangers. Captain Silver, a rough-hewn, bluntly honest sailor involuntarily catapulted into intrigue, was a perfect character for Buster to play, and his confrontations with the much slicker Admiral were some of the serial’s highlights. Above: Buster Crabbe slugs the treacherous Hugh Prosser in a lobby card for The Sea Hound (Columbia, 1947). Above: Robert Barron (as the Admiral) temporarily has the advantage of Buster Crabbe as Captain Silver in The Sea Hound. In the late 1940s, Crabbe went on the road with his own swimming show, “Buster Crabbe’s Aqua Parade,” touring both the US and Europe until the show folded in 1950. He did few movies and no serials during this time, but returned to cliffhangers in 1950 with Columbia’s Pirates of the High Seas. This serial involved Crabbe, as sea captain Jeff Drake, in a complex mystery involving diamonds stolen during World War 2, an ivory cigarette case that held a clue to the cache, and a war criminal trying to recover his ill-gotten gains. Lois Hall was the leading lady and Tommy Farrell the sidekick in this entertaining South Seas adventure, which was very similar to Sea Hound in theme and setting (complete with more Catalina location work) but a good deal more interesting, thanks to a tighter script and action scenes handled by expert directors Spencer Bennet and Thomas Carr. Crabbe was at the top of his form as the rough-and-tumble sea captain, exchanging some very witty lines with Farrell and beating up villains with gusto. Pirates was one of the best of Columbia’s later serials, and was reportedly Buster’s own favorite among his cliffhangers, since it was the only one in which he played an original character not adapted from books or comics; this left him free to play the role without worrying about how he’d measure up to fans’ preconceived ideas of the character. Above: Buster Crabbe (right) and Tommy Farrell prepare for a siege in Pirates of the High Seas (Columbia, 1950). Crabbe had begun his serial career with a jungle cliffhanger, and he finished it the same way. Although King of the Congo (Columbia, 1952), was a good deal better than Tarzan the Fearless, it was still the second-weakest of Crabbe’s serials. Lacking the interesting locations and varied supporting casts of Crabbe’s first two Katzman serials, Congo was more notable for the typical flaws of Katzman’s chapterplays–cheap-looking sets, slow pacing, and an overly-padded storyline. Crabbe, however, delivered a solid performance as comic-book hero “Thunda”–a Tarzan type who was really a US Air Force officer named Roger Drum; in the first chapter, he was sent to the African jungle to investigate Communist activity there, and was aided by a primitive tribe called the Rock People after a plane crash. After helping these natives fight off their enemies–the very Communist spies he was looking for–he was awarded the title of “Thunda, King of Congo;” he spent the rest of the serial trying to prevent the spies from obtaining a priceless, uranium-like metal, first by posing as one of the spy ring and then by openly battling them and their allies the Cave People, with the aid of the Rock People. Despite the serial’s flaws, Buster held his end up well, in both the acting and the athletic departments; it’s interesting to observe that Crabbe, after almost twenty years, could still play a jungle lord as effectively as he had in his earliest acting days; few major stars kept in such good condition throughout their career. Above: Buster Crabbe battles a hirsute Cave Man (Rusty Westcoatt) in King of the Congo (Columbia, 1952). Throughout the rest of the 1950s, Crabbe made occasional appearances on anthology TV shows like The Gulf Playhouse and Kraft Theatre, and starred or co-starred in a few independently-produced feature films like Gun Brothers and Badman’s Country. His only major acting venture during this time was Captain Gallant of the Foreign Legion, an adventure television show shot on location in Morocco that co-starred his young son Cuffy and ran from 1955 to 1957. Following the termination of Captain Gallant, Crabbe more or less retired from acting to run a swimming pool corporation and serve as an athletic director at a New York hotel. He periodically broke his retirement for occasional films in the 1960s and 1970s, including a cameo in the 1979 Buck Rogers TV show. He passed away in 1982. The Flash Gordon serials were aired frequently on TV beginning in the 1950s, making Crabbe a familiar face to a whole new generation and causing him to be a much-sought guest at the earliest serial conventions. The Gordon serials, due to their proliferation on television, kept the memory of other serials alive, and thus when the videotape arrived on the scene, there was a strong existing demand for serial videos, which in turn brought cliffhangers to yet another generation. Many serial fans, the author included, would not now be able to watch and enjoy cliffhangers had it not been for the popularity of the Flash Gordon serials–popularity owing in part to the performance of good old Larry “Buster” Crabbe in the title role. Serial buffs thus owe him two votes of thanks, one for his participation in the Flash Gordon trilogy and another for the good-natured enthusiasm he brought to all his serial roles. Above: Buster Crabbe in publicity stills for Flash Gordon (right) and Flash Gordon’s Trip to Mars; below, a publicity still for Flash Gordon Conquers the Universe. Acknowledgements: The Old Corral’s page on Buster Crabbe and the Flash Gordon/Buster Crabbe page at Tony LoBue’s site provided me with most of the biographical information in this piece. I shutter at the thought of a “Flash Gordon” without Buster Crabbe and this tribute illustrates why. Crabbe is gone, but the “King” lives on!